On Friday, November 6th, 2015, General Motors South Africa celebrated the production of the 250,000th Chevrolet Utility pickup truck at its Struandale plant in Port Elizabeth. The quarter millionth small pickup truck (called bakkie in South Africa) was a 1.8 Utility SPORT model, with the milestone marking a 17-year production period of one of South Africa’s most popular vehicles. 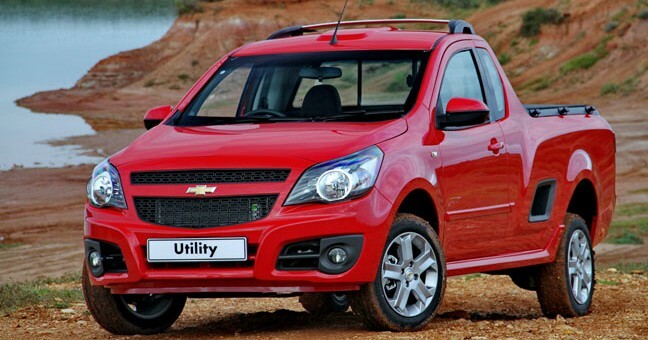 Based on the GM’s Gamma platform, the Chevrolet Utility is sold in some South American markets as the Chevrolet Montana. Now in its third generation in South Africa, it is built “with the South African customer in mind, a reliable vehicle for work and leisure”, according to Chevy. “We are proud of the fact that this is a South African built bakkie. Our Struandale plant is efficiently geared up for light commercial vehicle manufacturing and we pride ourselves in building quality vehicles for our customers,” said Ian Nicholls, President and Managing Director of General Motors Sub-Saharan Africa Operations. The quarter millionth Chevrolet Utility rolls off the production line at GM’s Struandale plant in Port Elizabeth, South Africa. Clayton Whitaker, Plant Manager (right), Ian Nicholls, President and Managing Director of GM Sub-Saharan Africa Operations (second from right), and the assembly team celebrated this milestone at the Struandale plant on November 6, 2015. GM recently launched two new Special Edition derivatives of the Chevrolet Utility — the UteSurf and the UteWorking. The UteSurf is designed to appeal to South Africa’s “fun-loving individuals”, and is fitted with a tubular stainless steel sport bar and a roof rack/spoiler combination, making it simpler and safer to carry lifestyle accessories. Meanwhile, the UteWorking features business- and transportation-oriented add-ons. This small Chevy utility truck should be imported to the U.S. and sold, because the foreigners do import their small trucks, and outsell the other GM small trucks. I agree. I would sell the sports car and get one!